The construction of a train factory in County Durham has reached a significant milestone with the plant being connected to the main line network. The £82m Hitachi factory in Newton Aycliffe will employ 750 people, with the first trains coming off the production line in 2017. 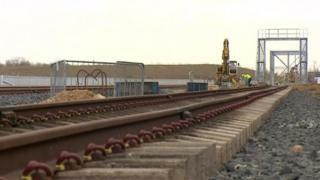 A new 1km (0.6 mile) electrified test track has also been built at the site. More than 100 high-speed trains will be built at the plant and will run on the East Coast and Great Western lines. The first prototype train, which will be tested by engineers at the factory, arrived in Newton Aycliffe earlier this month.